FoBCA wins the National Award for Groups! 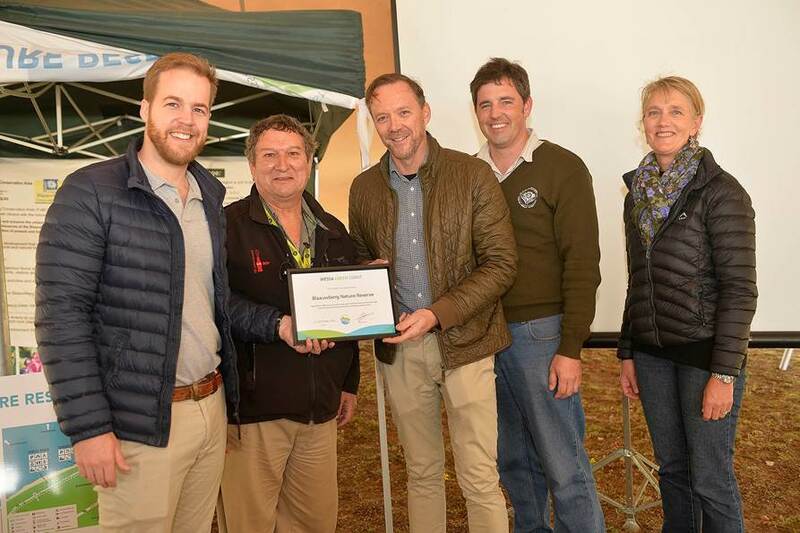 The Wildlife and Environment Society of South Africa (WESSA), paid tribute to a wide range of outstanding environmental achievements with the presentation of the organisation’s Annual Awards at the 92nd Annual General Meeting which was hosted by WESSA’s Eastern Cape membership branch at Cape Recife near Port Elizabeth on Saturday 15 September 2018. The WESSA Awards, which have been presented since 1974, enable WESSA to recognise and honour those who have made a significant contribution to the environmental conservation or environmental education sector in South Africa over the past year in an exceptional and sustained manner. The WESSA Group Award was presented to the Friends of Blaauwberg Conservation Area under the leadership of Roy Fuller-Gee. The FoBCA was chosen for the award not only amongst Friends groups, but amongst any group working in the environmental field. What a pleasant surprise, but if taking into account all the work done under the strong driving force of the past chairman Roy Fuller-Gee over the years and the many achievements, then it is well-deserved. Roy was flown to PE to receive the award for FoBCA. 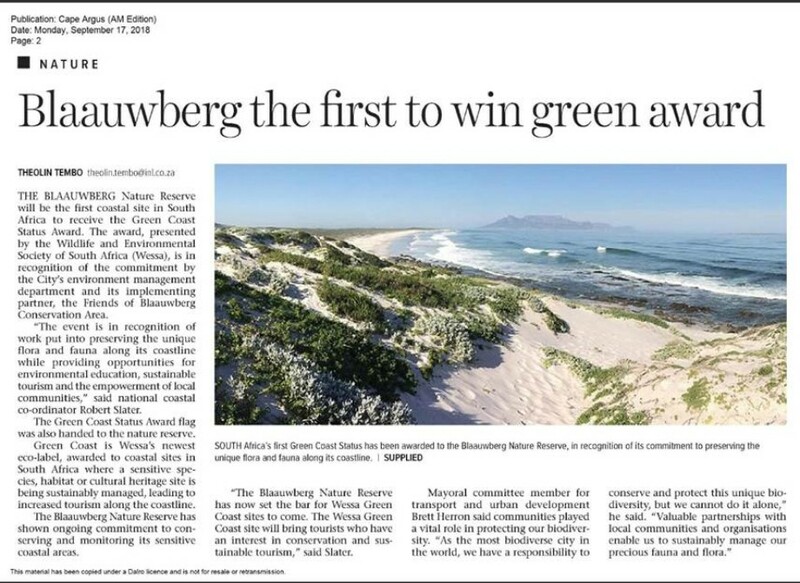 A big thank you to everyone who has over the years contributed to the success of the FOBCA, and who has given many hours to preserve, protect and promote the Blaauwberg Conservation Area - this is YOUR award! 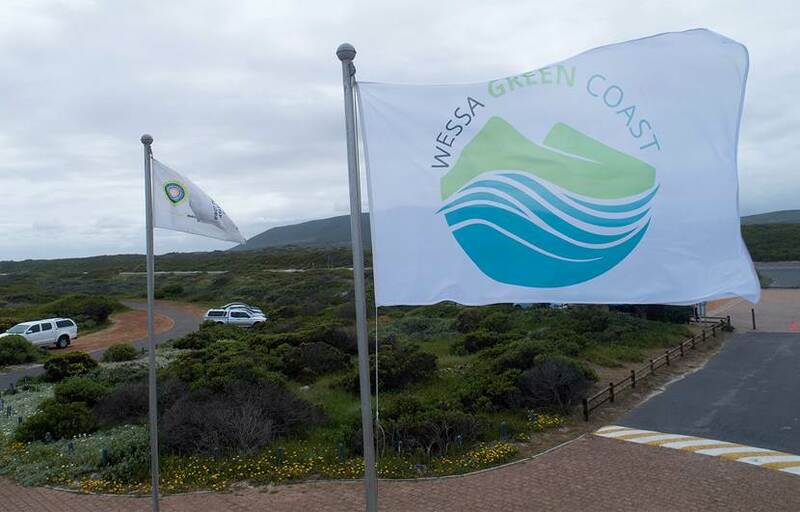 The new WESSA GREEN COAST flag proudly flying at Eerste Steen, BBNR. We will be giving you regular updates on the Green Coast Project as successful progress needs everyone’s co-operation. Our star team – the Alien Vegetation Hackers! We recently interviewed the BBNR alien vegetation hacking team. 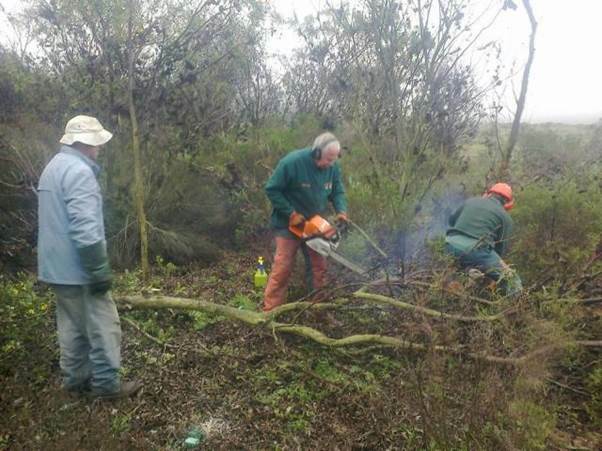 They brave all kinds of weather every Tuesday to help the conservation staff in clearing the vast tracts of aliens growing on the BBNR. If you look at the pictures below, you will see the extensive area that has already been cleared. When did the hacking team start? We started hacking on BBNR on 27 April 2012, with 3 members. How many in your team? The team now consists of 7 members with 5 attending regularly. We have some varied ages in our group, with the oldest being 75 years old. If you see us working, you will not believe our ages though. We call it our outdoor gym! How often do you meet? We meet at 7h15 every Tuesday weather permitting – a very early start to avoid the heat of the day. How do you decide on where and what to clear each Tuesday? Jacques Küyler, the City of Cape Town Biodiversity Area Coordinator responsible for the Blaauwberg Nature Reserve, discusses with our Team Leader, Eddie Heimann, what needs to be cleared and then the team will do the detailed planning for the day. Between November and February each year, when it is too warm for the hard work, we do what we call ‘follow-up’ clearing. We then go over every single area we have cleared up to now, and clear all the new growth. Over time the area for follow-up clearing gets bigger but the effort becomes less. The job is endless, though – the aliens have an amazing power to resurface. Have you ever come across any snakes? Yes, mole snakes, but the chainsaws and hacking cause such a din, that the snakes stay away. We always look out for puff adders, because they don’t move away, but fortunately up to now have not encountered any. We have been threatened by the Eland bull though! And other animals? Yes, we often see duiker, caracal, and we followed a breeding Martial Eagle nested on the power lines for a long period until the eaglets hatched. We don’t often see the hartebeest as they are shy buck, unlike the Eland. What equipment do you use? Chainsaws, loppers and bow saws. For follow-ups, spades are used. One member has been using his personal chainsaw that is already 13 years old. If you think of the hard work the chainsaw does every week, then it is really good – they don’t make them like they used to! Do you relax in between? Not really, as we want to achieve the maximum before the heat sets in for the morning. We work flat out for 3½ hours. However, once a month, we end with a braai, and of course we also have a year-end braai! What about safety precautions? That is of course very important. We wear pants made of Kevlar material. This is the kind of clothing that space crews wear – if a saw slips, and goes into your leg, the blade can’t go through the material. You will see quite a number of tears on the clothes on the photographs. We are lucky to say we have never had an injury. We also have certain security practices like always standing behind someone who uses the chain saw. And of course we also train the new hackers first before allowing them to use the chain saws. We have a first aid kit at hand in case something happens. Are you sometimes involved in special projects? 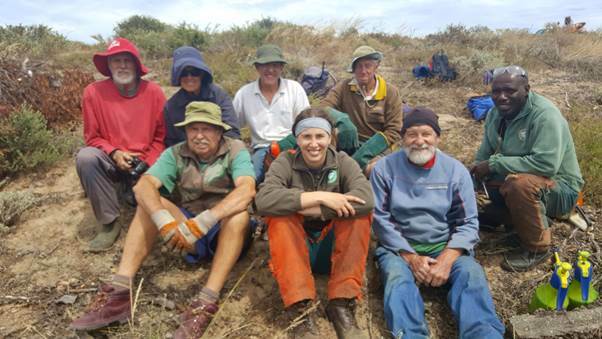 We helped in clearing the Coastal Dune Trail (the popular BBNR trail that starts opposite Eerste Steen), and we sometimes help in Atlantic Beach and the Witzands Reserve when required. We also help clearing fire breaks such as recently the one leading up to Kleinberg. The Hack Team in action! 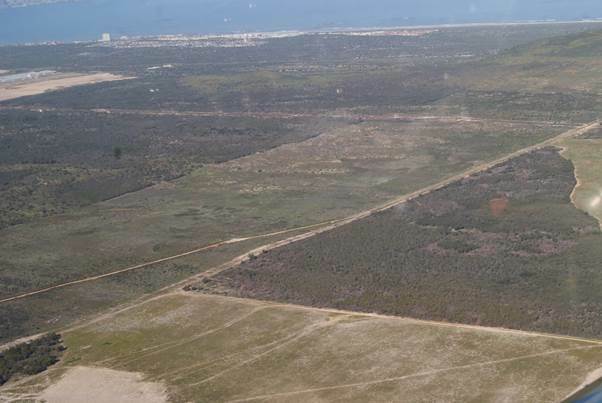 An aerial view of the vast area already cleared by the Hack Team. 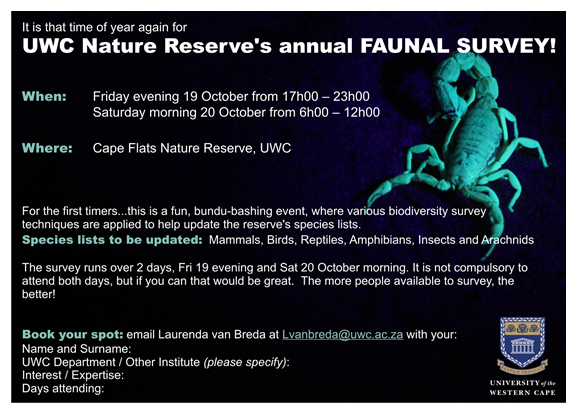 For more information on the Blaauwberg Nature Reserve and any events of the Friends of BCA, please visit our website www.bca.org.za. 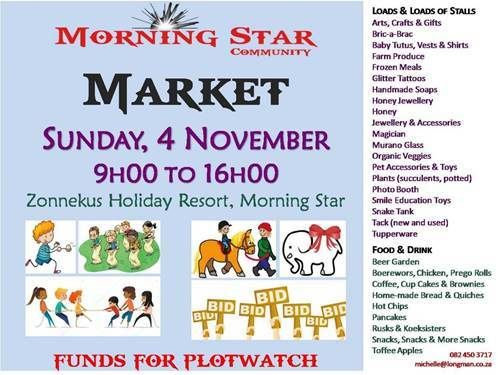 • Sun 4 Nov – Morning Star Morning market. As neighbours of the BBNR, and in appreciation of the important work that the Morning Star Plotwatch is doing for security of the area, the FoBCA will host a stall at this market. Come and join in the festivities and pop by to say hello! 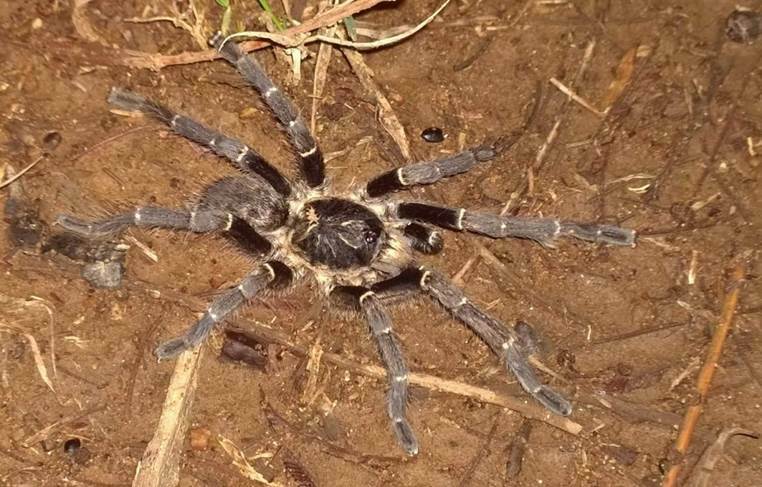 The Baboon Spider Atlas project team, part of the Animal Demography Unit at SANBI, has a plea for us to keep a look out for baboon spiders during field trips. The Baboon Spider Atlas is a project following in the steps of other recent atlas projects for butterflies and reptiles. We hope to publish an atlas for these spectacular but elusive and poorly known animals in a few years’ time, and we need as many photographic records as possible. Please photograph any baboon spiders you might see, from above or a slight angle to the side, and submit your photos to iNaturalist or the ADU Virtual Museum. Or even more simply, you can upload photos on the project website at www.baboonspideratlas.co.za. All records submitted through the website are also stored directly on the ADU Virtual Museum. Baboon spiders are large, hairy spiders like the one in the photo below, but there are some smaller species too. You're welcome to submit photos of any spider you suspect might be a baboon spider - it will be stored also. To learn more about the project and where you might find baboon spiders, please visit the website. We look forward to seeing your exciting discoveries!